Without a doubt, a hot bowl of soup comforts and warms us when the weather is less than optimal. 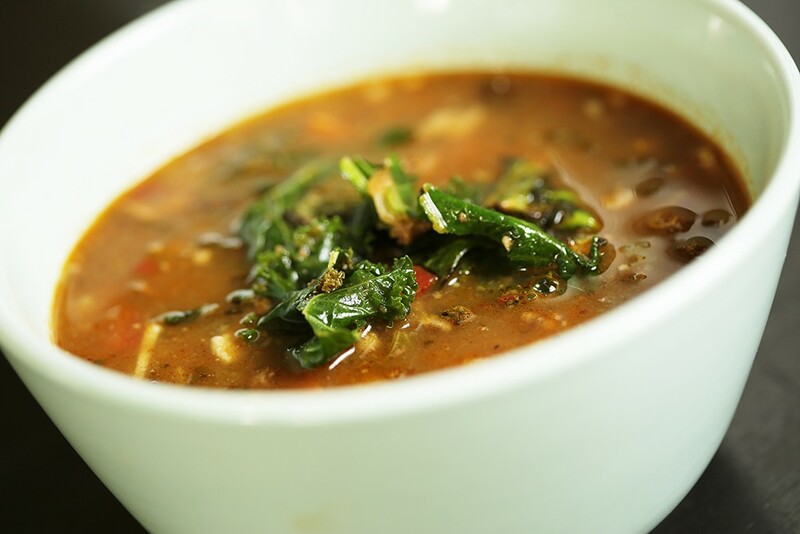 But even more than being an inexpensive and quick option for meals, soup can help meet important health goals without sacrificing flavor or variety. Easily loaded up with vegetables, soup can deliciously incorporate a variety of ingredients to combat diet-related diseases. And it can help you lose weight — studies indicate that people who eat broth-based soup end up consuming about 20 percent fewer calories, says Terry Perry, director of kitchen programs at Second Harvest in Spokane. "Soup has always had really great benefits," she says. "It's inexpensive, it provides so many nutrients. I think it's great." Whether you're trying to lose weight or simply approach food more thoughtfully, soup is a good option, adds Nikki Strong, a Spokane-based nutrition coach and registered dietitian. "I think it gives people an opportunity to mix in some extra vegetables. One of my favorite aspects of soup is it encourages mindfulness while you're eating," she says. "Because it's hot, it slows you down, which is a key component for people who are trying to lose weight. "So much of what we do is grab-and-go, so we end up eating a bunch of calories without really thinking about it. Eating something slower makes you check in and be more aware of what you're putting into your body." While diet fads come and go, one thing that seems persistent is the drumbeat to increase the number of servings of vegetables and fruits we consume each day. Recent research into the healthiest diet for the heart, called the OmniHeart (Optimal Macronutrient intake) diet study found that adherents lowered blood pressure and improved blood lipids by following any of the three diets studied — one emphasized carbohydrates, one emphasized protein, and one emphasized unsaturated fats. The protein and unsaturated fat diets both produced longer-term cardiac risk reduction. But all three diets included generous amounts of vegetables and fruit each day — ranging from 9 to 11 servings. Getting in the recommended servings of fruits and vegetables — not to mention whole grains, nuts, beans and other food groups — can be challenging, especially when coupled with efforts to reduce sodium, sugar and saturated fats. 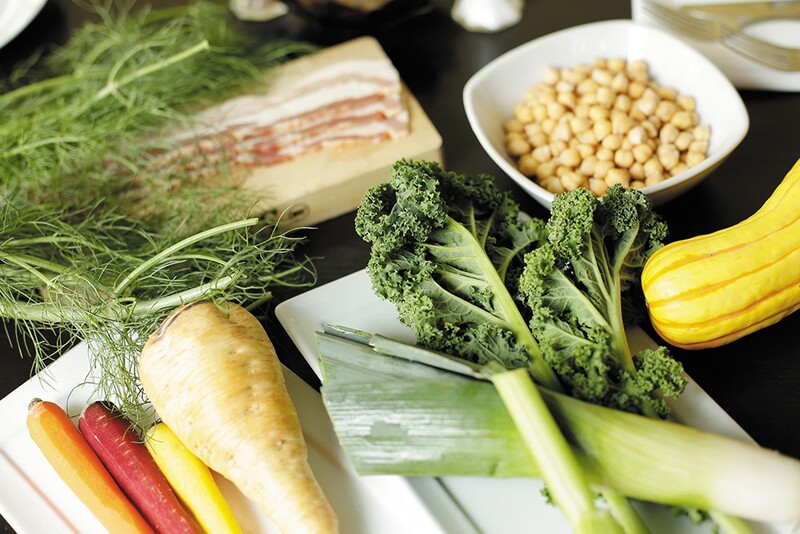 Soup, however, offers a foolproof way to pack in macronutrients. Using vegetables, herbs and spices, legumes and grains, it's possible to create enjoyable flavors in a dish packed with nutrients. It's not magic: "If you hate a vegetable, I wouldn't put that in your soup," says Strong. "Make it so you'll actually want to eat it. Look for a variety — things with a lot of color, such as spinach and dark carrots and things like that," Strong adds. "The more you can add in there, the better." With practice, soup can be an easy way to use leftovers or pantry staples, Perry adds. Smaller servings of meat and vegetables that are starting to look a little sad are revived when mixed with broth and a can of beans. Just keep the rice, noodles or barley in balance, so the soup doesn't go overboard on carbohydrates, crowding out other ingredients. Whatever combination, whether following a recipe or relying on instincts, homemade soup is almost certainly better than the canned varieties. "A lot of the soups you're going to buy out of a can have a lot of extra sodium and preservatives that your body doesn't really need," Strong says. Soup isn't solely about vegetables, though. Strong and Perry recommend broth-based soups to add flavor and avoid the extra fat and calories of cream. Even more, they recommend making your broth from scratch — an easy technique that involves simmering roasted animal bones in water with some vegetables and seasonings. The process draws out nutrients from the bones, and combined with the flavors from the vegetables, creates a perfect substitution in any recipe that calls for water. Homemade broth has the added benefit of containing less sodium and being less expensive than store-bought versions. "It's so simple to make your own broth," Perry says. Throw in onion, celery, and carrots to simmer with the bones for extra flavor. "And there you have the same base as expensive restaurants." Coeur d'Alene's Astrid Rial (aka, the Cycling Chef) started making bone broth just two years ago but she loves talking about it so much — and inspires the friends she talks to so effectively — that she's considered a local expert on the subject. From September to April, she has a crock pot full of liquid simmering at all times. She stockpiles bones from whole chickens barbecued in summer, ventures to the butcher shop to ask for the pieces that would normally be tossed out, or culls bones from wild game hunted by friends. Bags of surplus pork, beef and chicken broth are labeled and stacked in her freezer. At first, she followed recipes for broths that simmered for a few hours. But as her interest expanded, her research took on greater depth, including a book published in 2014 called Nourishing Broth: An Old-Fashioned Remedy for the Modern World, which included a recipe that called for leaving the bones simmering for four to five days. She didn't even know if her crock pot could handle cooking overnight, but she decided to try making a broth with lamb bones. "I put them in around 6 o'clock at night. We woke up in the morning and we came downstairs and my kitchen smelled medieval," she says. "The smell was just amazing, and that had just been after it cooked for about 12 hours. It was creamy and the texture of it was amazing. I let it go for three days the first time. The flavor is just very deep when you let it go for a long time." The method is known as perpetual broth. She leaves a ladle and a strainer next to the crock pot to scoop out and use some whenever she needs it. After a wet afternoon at soccer practice, her 13-year-old son requests a cup when he gets home. He also likes it as a savory cup of tea with his breakfast in the mornings, says Rial, who uses it to cook soups, stews and chowders during the cold months. "As you take broth out of the pot, you add more water and it just keeps simmering," she says. At the end of the week, she strains and freezes whatever is left over. "When you let it go for four or five days, the intensity of the flavor and the color of it becomes this beautiful, rich brown broth." Teri McKenzie, founder of the Inland Northwest Food Network, most appreciates the lightness of bone broth during a time of year that is often known for heavy foods. Her interest in making her own broth grew with her work with local ranchers. As she met more people raising animals in the way that fit with her values, she was willing to expand her diet to include red meat for the first time in more than 25 years. "I love soup, it's really nourishing and nurturing," she says. "Obviously soup is a key food for this time of year here. Bone broth is one of those types of food I'd recommend people eat and ... use our local meat — elk or venison. Or beef or chicken. And I love the idea that it's not wasting. Nothing is wasted in the animal, then. That's another reason to support it." She uses her broth in soups with beans and vegetables that change with the season. In winter, she relies on root vegetables and kale. Or she goes another direction, using the broth to make pho — a meal her family has used as a cold-weather superfood for a long time. "If somebody got the flu or got the bad cold, we would go and buy it," she says. "It was such a cure-all. It seemed to be so healing." But is it? Some nutritionists and food scientists are skeptical of any claims that bone broth is, in fact, healing. But it does provide a source of nutrients, including amino acids, calcium and protein, that may be lacking in someone's diet. Perry says broth packs in extra nutrients, but it's really just one piece of a well-built meal. "That broth is beneficial," she says. "But the more veggies you add to it, the more beneficial it's going to be." At Clover in Spokane, soup can be a nostalgic affair or an $8 adventure in fine dining — from a cup of traditional tomato soup with a grilled cheese sandwich for lunch to a creamy mushroom soup garnished with goat cheese and duxelles (a deliciously fancy term for chopped mushrooms, shallots and herbs sauteed in butter). 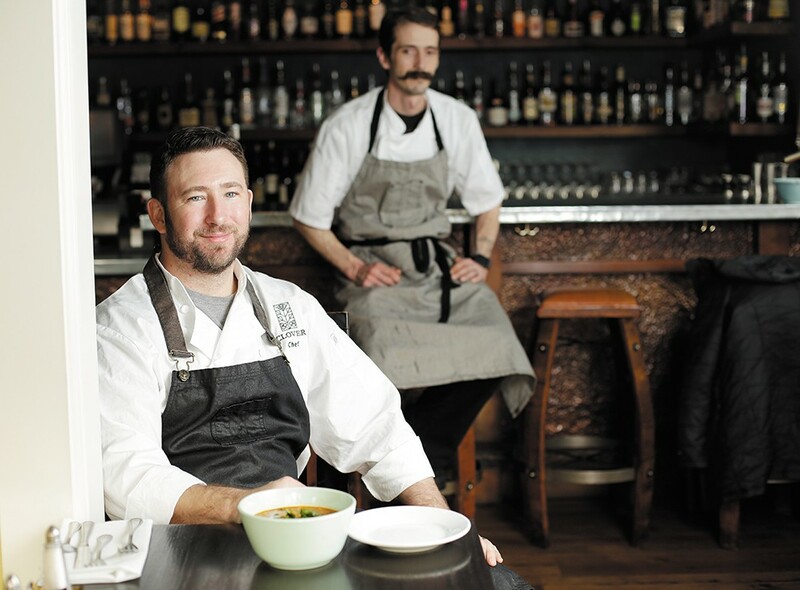 Clover chef Travis Dickinson says soup is an easy, rotating item on the menu because it leaves so much room for experimentation, while also relying on the quality, seasonal ingredients that the restaurant is known for. He likes simple recipes focused on a single puréed vegetable, like cauliflower, just as much as a chunky soup with a variety of veggies. Putting something new together is fun and easy when all it takes is rummaging through a stock of beautiful foods. "The big focus is keeping it seasonal — keeping it exciting," he says. Home cooks can take a similar approach, using soup as a menu item that changes with the seasons and moods of the meal. The point is that soup can be easy. Many grocery stores offer pre-chopped ingredients that can be thrown right into the pot, and frozen vegetables work just as well as fresh ones. For busy families, cooking from scratch can be daunting. But making it a team effort, using tools like a crock pot, and keeping a few servings in the freezer to pull out at the end of a long day can make it less intimidating and impact more than a family's health. It can be difficult to get children to eat vegetables, but when they have a hand in preparing dinner, they are usually more excited to eat it, Perry says. Spending time together in the kitchen often gives way to conversation and socializing that feeds the soul as much as the stomach. this soup with a variety of beans, grains or noodles. In a separate pot, cook soaked garbanzo beans in salted water to desired texture. Al dente is perfect, as they will continue to cook in the soup. Dice all veggies to half-inch. In a heavy bottom pot, render bacon over medium heat, until halfway cooked. Add sausage, brown. Add mirepoix (leek, celery, carrot, parsnip); cook till the mix begins to soften. Add fennel, peppers and garlic and cook till softened. Stir in tomato paste and continue to cook for 2 minutes, stirring to avoid scorching. Deglaze with sherry and cook until thickened by the paste. Add stock and tomato juice; bring to simmer. Add dry spices, cooked beans, potatoes and squash; cook until potatoes are soft but not mushy (about 20 minutes). Add kale, cook for an additional 5 minutes. Season with fresh herbs, kosher salt, and pepper. 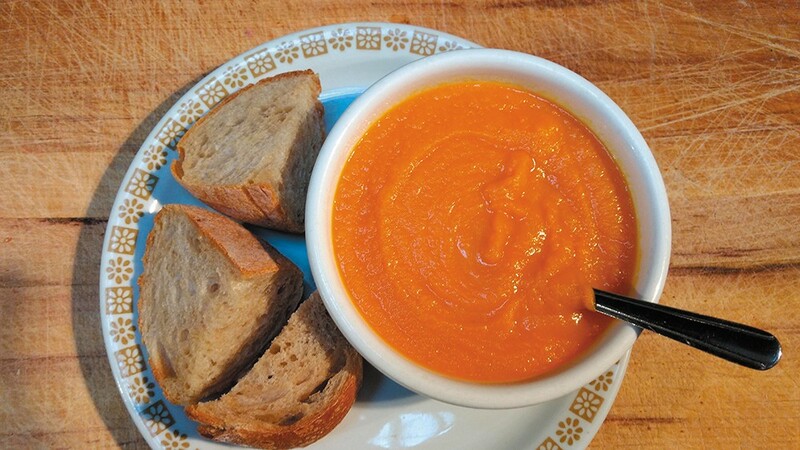 "This is a simple but flavorful soup that is perfect for a cold winter day," says Patty Brehm, owner and chef at the Kitchen Counter in Moscow, Idaho. "The ginger and other spices in the curry are good immune boosters. It's also a great way to clean out your fridge. Throw in any spare vegetables you have!" Soup class on Thursday, Feb. 23. Register online at secondharvestkitchen.org. Preheat oven to 350 degrees. Cut tortillas into ¼-inch by 2-inch strips and place on a sheet pan lined with parchment paper. Lightly spray the strips with pan spray and bake until golden brown. Astrid Rial of Coeur d'Alene is known locally as "The Cycling Chef." She's been experimenting with long-simmering broths — measured in days, not hours — and recommends this recipe, which offers plenty of ways to make it all your own. Fresh or dried herbs, to taste: thyme, rosemary, parsley, sage, etc. Whole spices of your choice (as many as you like): galangal, black peppercorns, allspice, juniper berries, whole dried turmeric root (or fresh), fresh ginger root, mustard seeds, etc. Roast bones for 30 to 45 minutes in 350° oven. Cover ingredients with cold/room-temperature water in a crock pot. Simmer on low for 1 to 5 days. Remove from heat and strain and use as a base for any soup or sip by itself. Add fresh herbs like parsley, dill or cilantro just before serving.